While our developers were working on GDPR and a few new great features that will all be released soon (hold tight, we got some huge things coming) we did work on some smaller improvements that can make your user experience even more awesome. Google works in mysterious ways, so GA token gets revoked from time to time and when it happens the notification will pop up. The improvement is that in the case of Google Analytics errors “token expired” or “lost connection”, you can now see which email is attached to that GA in the bell notification. As you probably already know ManageWP is fully compliant with GDPR. That said, you are now able to export your personal data in a portable format. The option to do so is located in Settings >>> Profile. We have added cookie consent and privacy settings. 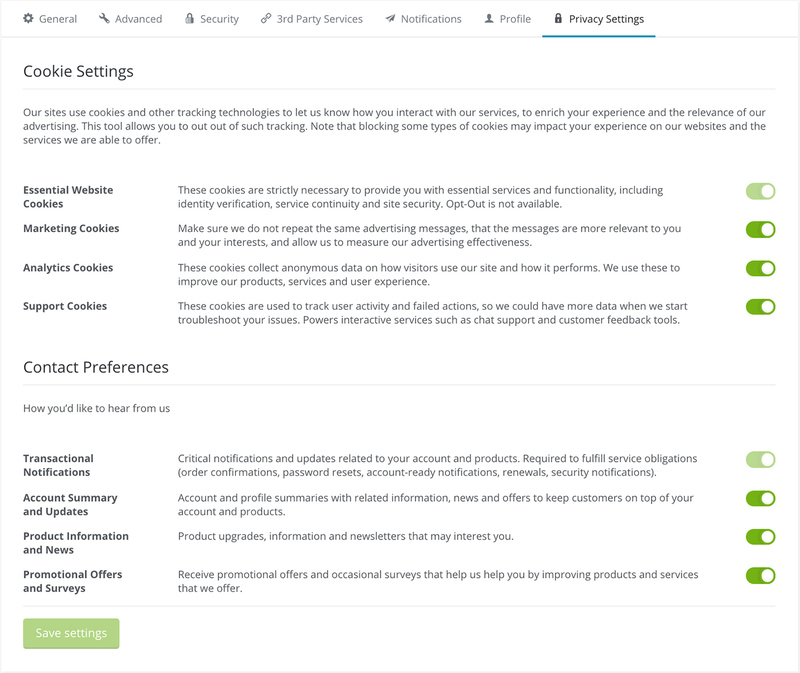 You can change your privacy settings at any point in the dashboard under Settings >>> Privacy Settings by turning the toggle button on and off for different Cookies and Contact Preferences. You can now use SSH key when cloning/restoring a website instead of using an SFTP password. When you click on ‘Show public key snippet’ at the bottom of the ‘Enter connection information’ section, the key will appear. You should just paste the code into the server console to apply the key. We are planning a few improvements for managewp.org. We’re implementing new article ranking algorithm, new vote strength, and some changes for distribution around user activity. Based on your feedback, we are implementing few improvements to the safe update feature. We will be adding more details for users in case plugin/theme update fails and display that information more clearly. Thank you for helping us making ManageWP even better. And on that note, I’d like to invite everyone that would like to share their stories and their knowledge to share them over our Blog. We are looking for a fresh content, where new people would see a real-life example of how ManageWP works and what’s going to happen once they sign up. The existing users would have the chance to have an ‘a-ha! moment’, where they could see new ways of using certain features. If you would like to contribute or share some other stories or examples around WordPress, website management, working with clients or anything that would be helpful to your fellow ManageWP users, please submit your ideas through this page: managewp.com/guest-posting-guidelines. The articles will go on the official ManageWP blog, and you will be properly credited for your effort, with backlink and everything. Hopefully, we’ll have more of these real-world use-cases and help each other to have more time for other important things in our lives. Tijana - a walking-talking bundle of superpowers: sports medicine and fitness professional, SEO expert, blogger, designer and a kitty foster mum. Managed WordPress Hosting: Are You Ready for an Upgrade?